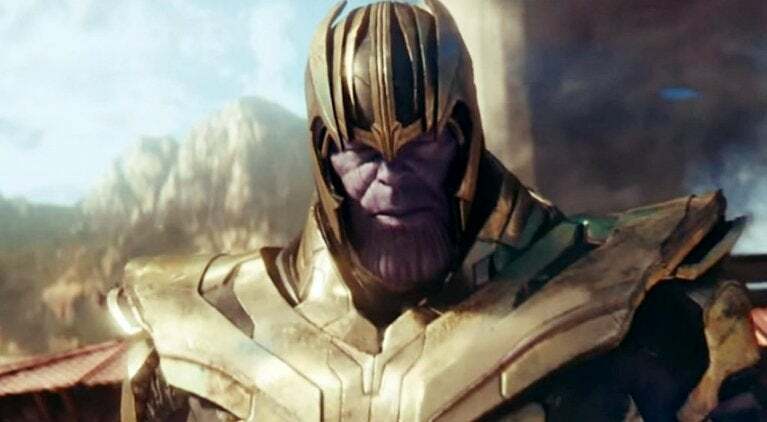 Thanos managed to achieve his plans of universal balance in Avengers: Infinity War and Marvel fans are thinking Kanye West might be following in his footsteps. It all stems from a recent Kanye West tweet where the rapper said: "our whole culture is about balance". It might have something to do with a previous tweet he sent out that said "when you think of something positive say it out loud. Keep putting that vibe into the universe", and the balance message seems like a natural extension of that. For many though the Thanos comparisons proved too good to pass up. Being that Thanos' entire mission and message in Infinity War was to balance the universe to bring it back into prosperity, it kind of makes sense. That kickstarted plenty of fan compositions and witty remarks regarding a Kanye becoming Thanos scenario, but there were plenty of other great theories too. 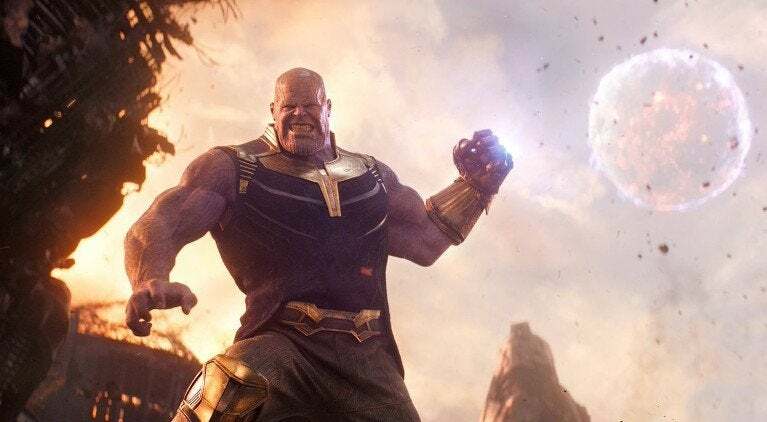 While Kanye won't be making an appearance in Avengers 4 (at least we don't think, he will), Thanos will be making a big return for the anticipated film. In Infinity War Thanos managed to get everything he wanted, but the heroes are backing down until they give it at least one more shot, and thankfully they will have some help. The remaining heroes Captain America, Iron Man, Hulk, Thor, Black Widow, Rocket Raccoon, Okoye, M'Baku, Ant-Man, War Machine, and Hawkeye will get a boost from the returning Captain Marvel thanks to Nick Fury's last-minute S.O.S. at the end of the film. It still might not be enough, but it is going to be one heck of a last stand. Kanye could probably help a bit if they asked, but according to fans he just might end up being their main opposition if he is indeed Thanos, so hit the next slide to see some of the best memes and reactions. "Kanye this is a very thanos-like statement "
West's "Balance" comment had fans quickly thinking he had turned purple and decided to bring universal balance to the world. Seems now no one can bring him down. "Why Kanye talking like Thanos "
Someone needs to go ring an alarm for the Avengers because Kanye's gone from through the wire to reshaping the universe. "Oh no Kanye is Thanos "
From this fan-made image, it seems Kanye's gone from designing shoes to designing gloves, and his latest design is sporting some big rocks. Turns out stones are forever. "Thanos Kanye Thanos Kanye "
Some saw that tweet as Kanye admitting he was secretly among us as Thanos, living the good life right in our midst. Yep, and there are way more of those where that came from. Slide 6 of 10Give It Back! Some fans just thought maybe Kanye had been robbed, perhaps by a Mad Titan who just really wanted Kanye's phone. "Thanos stole kanye’s phone "
Other fans think Kanye perhaps is the one who finally beat Thanos, succeeding where the Avengers failed due to all that Power of Pride. "Maybe that’s how Kanye beat him. Kanye’s pride outlasted Thanos"
Another theory amongst fans is not that Kanye beat Thanos, but instead took over him, truly showing no mercy. How do you know Thanos wasn't taken over by Kanye? "How do you know Thanos wasn't taken over by Kanye?" One fan has a different scenario in mind, theorizing that instead of overtaking Thanos or beating him that Kanye is instead a child of Thanos. If that's the case, Thanos better watch the throne. "Kanye is a Child of Thanos." 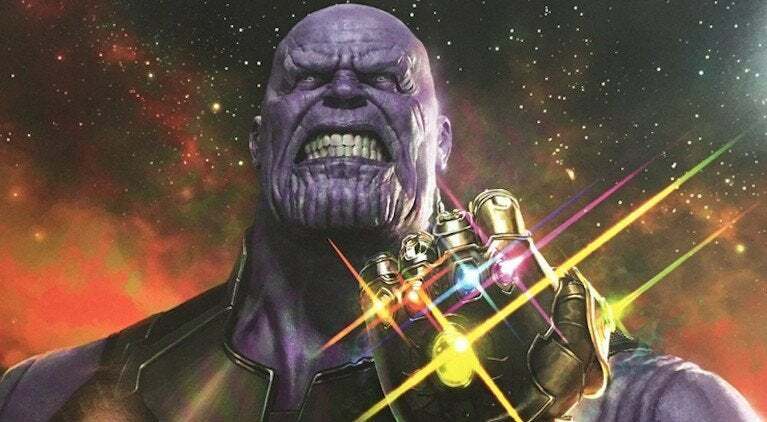 Another fan-made Thanos Kanye mashup features Kanye's face on the Mad Titan's body, sporting only two of the Infinity Stones. Soon enough though he'll have all of the lights to change the world.